I added a new gallery to showcase some of my images I've shot underwater in other locales. I've been fortunate to visit and photograph in some incredibly beautiful places. I've also interacted with a few creatures that you won't find in Lake Tahoe. Please take a look and get in touch if you have any questions or comments. As always, thank you so much for visiting Tahoe Clarity. I spent a month in Raja Ampat, Indonesia this year. Of the 23 days we were in the islands, I spent 4-6 hours every single day in the water. I did manage to put the camera down for a little. Click the image to visit the Beyond Tahoe gallery. Fall is a wonderful season. It's my favorite time of the year to sit in the office and listen to the window howl outside. It takes me a month or two to acclimate to the cold. With some of my time, I've updated the store with a few new images. They're all cold themed. The one above was inpired by another water photographer, David Sandford. His shots of the waves on Lake Eerie are mindblowing. I'll try to get a bunch more images up for sale before the Christmas season. Check back soon. As always, thanks for stopping by Tahoe Clarity! Hi Everyone! Thank you for visiting tahoeclarity.com. I am traveling to Indonesia for the month of September and cannot complete orders in a timely fashion. I decided to close the Tahoe Clarity store for the month. I will reopen as soon as I return in mid-October. Please check back then! New images will be uploaded this fall. I'll be showing some of the underwater photography from Tahoe Clarity at the Carson City Community Center later this summer. I'll have a lot of large prints in the Sierra Room, which is open to the public during all city meetings. The show will hang from July 7 to November 9. Thanks to the Capital City Arts Initiative for all the support. There is a ton going on in the world of virtual reality. New cameras that can shoot 360 spherical video are becoming affordable, and the visuals are improving. Headsets are becoming commonplace, and the big online networks are adding features to host this type of content. But there are only few rigs that can shoot 360 video underwater with any semblance of optical quality. I decided to mess around with 360-degree photo stitching. I shot the panorama below with a Canon 5D Mark II and Aquatech housing mounted to a tripod. I stitched it using PTGUI and exported it with Pano2VR. Considering it's too cold for most people to swim in Lake Tahoe, I though it was kind of a cool way to check out underwater. This spring has been brutal on the clarity of Lake Tahoe. I can easily see the difference between last year and this year. The melting snowpack has dragged everything from nutrients and sediment to garbage and debris into the lake. Nearshore, I estimate visibility is now reduced to less than 20 feet. This is a far cry from the spectacular water Mark Twain described in "Roughing It." To monitor, these changes an organization named Project Baseline is collecting underwater photography of Lake Tahoe. They date and geotag the images in their archive. Most of the images are of recognizable underwater features. Over time, we'll be able to return to compare these photographs to newer ones to understand Lake Tahoe's condition. For more about what a photographic baseline does, please see the video below. The League to Save Lake Tahoe created a video to explain Lake Tahoe's amazing clarity. I donated some video footage of the shallows near Sand Harbor. The piece came out really well. I'm kind of an Instagram maniac. I spend a lot of time examining photos and exploring different accounts. I've found it's a great way to learn photography techniques and style. It's also a cool way to make friends. Lake Tahoe has an amazing and very active Instagram community. It's fun to keep up with these folks, but the other day I stepped a little outside of this circle. I messaged an account called I found that featured the funniest photoshopped photos of tiny surfers riding tiny waves. I thought maybe he can put some of his imaginary characters on Lake Tahoe waves. Dom came through big time. Check out Mini Waves By Dom on Facebook and Instagram for more of his awesome manipulations. Seasons exists above and below the surface at Lake Tahoe. With massive snowfall, this winter has been one for the record books. But all this snow means a lot of runoff into the lake. The runoff carries sediment and nutrients. These nutrients give algae the ability to bloom. And spring is blooming season. Lately, both in person and in photographs, I've noticed a green sheen on the rocks. This is attached algae that's driven by the rise in nutrients. If I had to guess, I would bet this year will be a record algae bloom, reflecting the record snowfall and runoff. I made a video about how researchers measure algae. It will be interesting to see what they record this year. Blue-green algae covers the rocks and old tracks at Sugar Pine Point State Park on Lake Tahoe's West Shore. Photo by Mat Nelson. Lake Tahoe's most iconic conservation agency is definitely the League to Save Lake Tahoe. The organization invented the Keep Tahoe Blue slogan that's now been printed on over 1 million stickers. They've raised hundreds of millions of dollars for regional conservation. Without their work, Lake Tahoe would look entirely different. There would be hundreds more piers, crushing lakefront development and possibly a freeway bridge over the entrance of Emerald Bay. 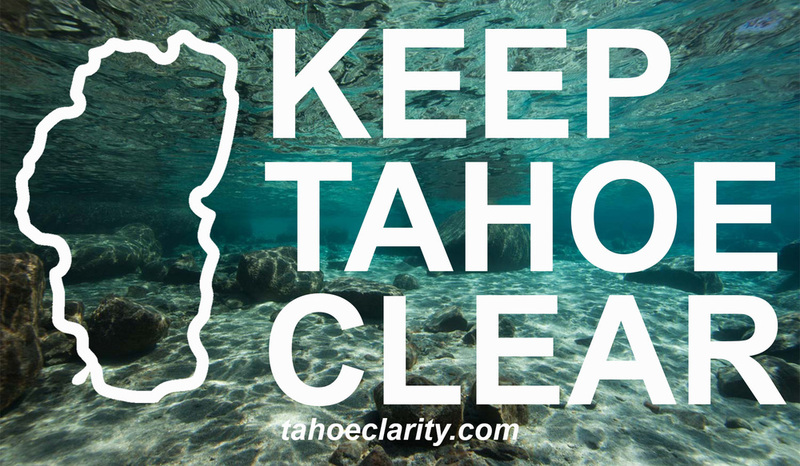 As I formed Tahoe Clarity, I had one early goal: I wanted my underwater images to help with conservation in our area. Though I wasn't sure of the value of the photographs, I sent the League a short email to see if they had any need. Chris, their spokesman, suggested I put a folder together. I sent him the link and kind of forgot about it. I was blown away when I got an email from Chris saying the organization had chosen some of my images for their annual report, and one was to be used on the cover. If that wasn't good enough, their wonderful designer, Marilee Movius, shared some very kind words on Instagram. "It made creating the layouts for the annual report inspiring and fun," Movius said. "Your images really capture why Lake Tahoe is so special. I look forward to continued collaborations." South Lake Tahoe's newest yoga/dance/pole studio, OMNI, also features some work by yours truly. What better way to get into your ZEN space than stretching and staring at Lake Tahoe's beautiful blues? Owner Jess Broyles was kind enough to offer some wall and shelf space. OMNI offers a bunch of awesome classes, including hot yoga, barre and, my favorite, Build the Booty Dance Fitness. For more information, check out this Tahoe Daily Tribune article. All prints at the shop are available for purchase. Check back frequently for new stock. It's wonderful to see The Basin covered in a blanket of white. The lake is nearing its natural rim, so we can look forward to healthy amount of water this summer. Snow on the shorelines adds extra challenges when shooting water photos, though. The added brightness of the fresh snow makes it tricky to balance exposures when shooting over-under photos. For best results, I've been shooting a lot on storm days when the light is a little flatter. Access has been tricky, too. It's definitely the first time I've ever had to go snowboard to go swimming. Mikaela and I rode our splitboards down the Skunk Harbor trail and I jumped in for a few images. Hiking out with a wet wetsuit in my backpack wasn't exactly a joy, but having the water all to myself was well worth it. Yeah, it's cold out there. But every time I get my wetsuit on and my gloves on and my booties on and duck below the surface, it's worth it. There's something about the teal water and the white mountains that makes shooting really fun. I put some new winter images up in the "New" gallery. Please check them out and as always let me know what you think. It's an honor to be featured in the Tahoe Daily Tribune, the Sierra Sun and the other Sierra Nevada Media Group newspapers. Reporter Claire Cudahy did a great job of capturing Tahoe Clarity in words. Visually, the story is really well laid out in the Sierra Sun. Articles like these really help build publicity for my project. Thanks so much, Claire! It's awesome to have a place that shows local art. South Lake Tahoe is full of talent and Benko Gallery has done a great job highlighting the work. I have a few pieces of Tahoe Clarity work there, including a 60-inch print of "The Dome," alongside a few other excellent Tahoe photogs. Benko has fun monthly gatherings and they're open almost everyday. Swing by to check the place out! Need a little more Lake Tahoe in your life? Follow @tahoeclarity on Instagram. We post a photo of Lake Tahoe's beautiful underwater world almost every day. We also offer occasional giveaways and news. As always, thanks for your support! A friend and UNR classmate, Luka Starmer, wrote a wonderful story about a diving adventure we had in Emerald Bay. He was kind enough to mention Tahoe Clarity and a few quotes by yours truly. His work and a few of my photos made the cover of the excellent regional publication, Tahoe Weekly. I woke up to a lot of buzz on my phone. Steller, the long-form storytelling social network, picked up a slideshow I put together of Tahoe Clarity images. They featured it as their story of the day and even sent the link in their newsletter. The story received more than 20,000 views and over 350 likes. Click the link below to check it out. Thanks Steller! My friends over at Rise Designs, an awesome screen printing and graphic design business in South Lake Tahoe, printed a run of stickers for me. I'm really happy with how they came out. They're thick vinyl. The colors and letters are really sharp. Shoot me an email at tahoeclarity@gmail.com if you'd like one. I'd be happy to send to Tahoe Clarity fans free of charge. After I launched tahoeclarity.com I had some people complain that the store wasn't very intuitive. I decided to redesign the way visitors order prints. It took me three days of one-on-one computer contact to improve the ordering process. I now feel like it's relatively easy to get any image printed. From the galleries, click the image or the link below that says "PRINT" and that will take you straight to a page to choose the style and size of your print. If you make an order, I'd love to hear your feedback. Thanks for checking out tahoeclarity.com!